I recently read the Shadows of the Apt books by Adrian Tchaikovsky, and I got struck by an idea for an embroidered piece. A little bit about the books: they’re a fantasy series, and the premise is that groups of people (called kinden) have gifts based on an ideal of bugs– Wasp-kinden can sting you with their hands, Ant-kinden have a telepathic link– and also, that magic is on its way out, and technology is on its way in. Some kinden have Aptitude– they’re capable of understanding technology and believe that magic was only ever a legend. The Inapt can’t comprehend even simple technology. The Inapt were dominant over the Apt for generations, but technology is leveling the playing field. As I was reading, an image wouldn’t leave me: the Apt species on some clockwork, and the Inapt species on a tangle of vines. 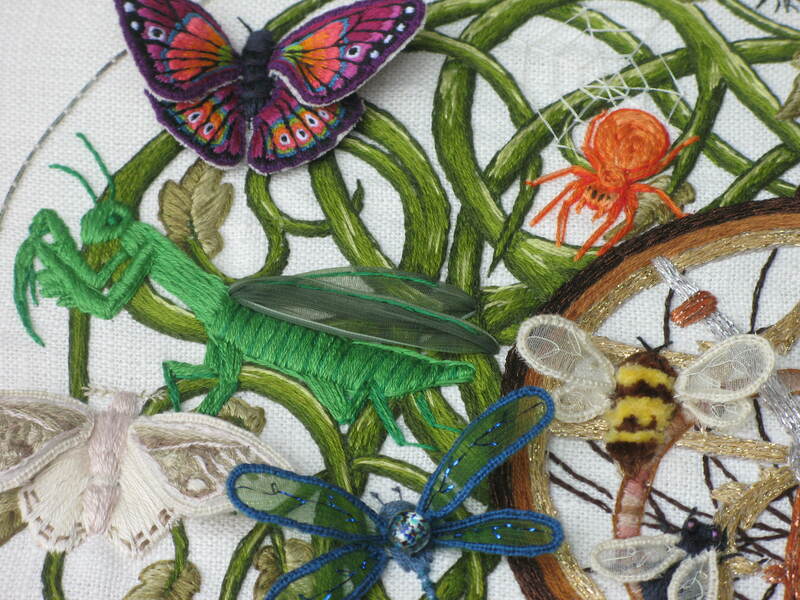 I started looking into stumpwork bugs, and decided that would be a striking way to get some dimension on top of the base embroidery. I ended up using an astrolabe to represent Aptitude. This is not the biggest, but certainly the most involved piece I’ve done to date. From drawing to finished piece took from January to May. 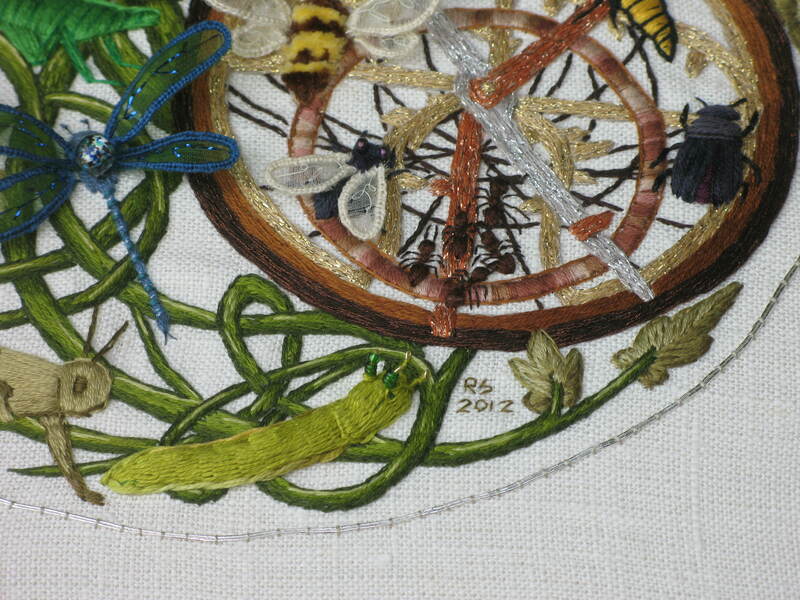 It was great fun to do, not least because I learned about stumpwork as I made it. 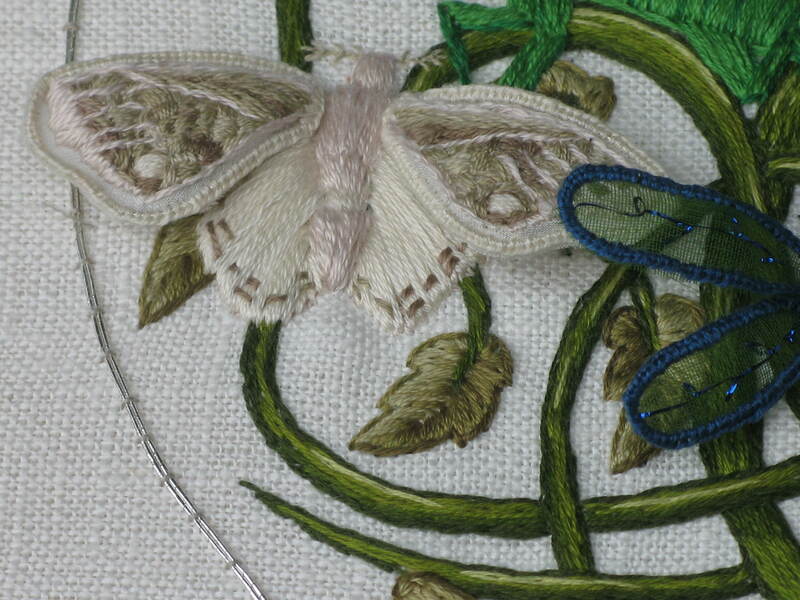 I feel that I’ve become proficient at stumpwork wings. I’ve read to the fifth book (there will be ten, and more are currently available in the UK than in the US) so there may well be cool bug species I missed out on. I had fun looking up pictures of the various bugs. Some of my reference photos are on my Pinterest bug board. Way too late in the game to do anything about it, it occurred to me that this could make a cool book cover. Though perhaps with fewer dimensional elements! I’m very happy with how it turned out; it’s very close to the original idea. 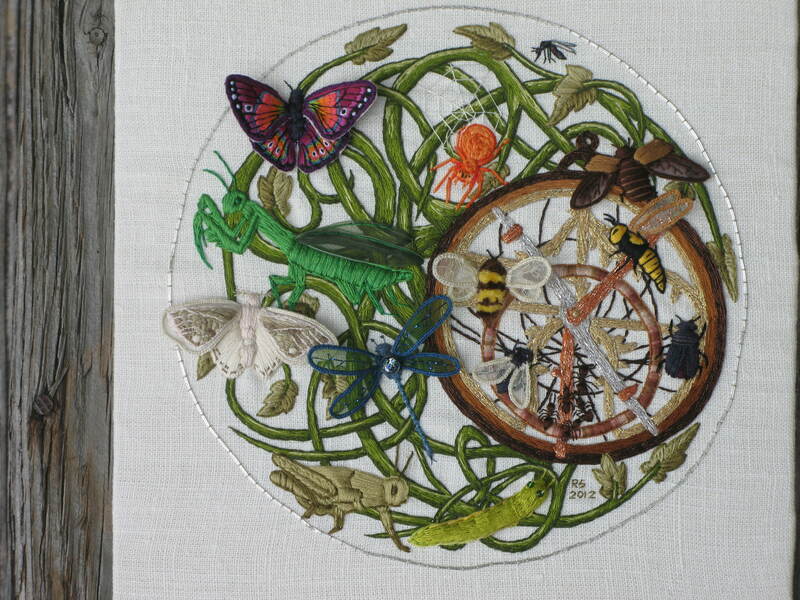 This entry was posted in Uncategorized and tagged books, bugs, embroidery, fan art, stumpwork, surface embroidery by Rene. Bookmark the permalink. Thank you! 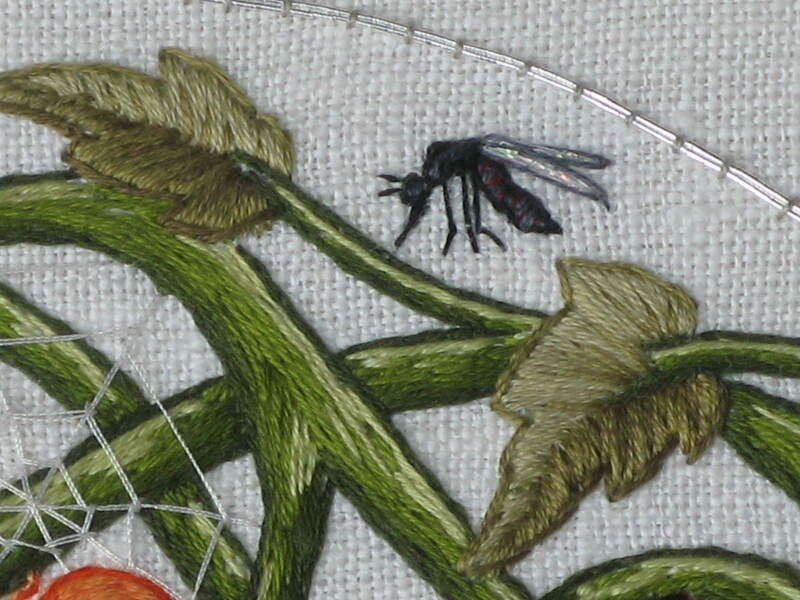 My sister is the same way with spiders– she looked away from that part of the piece. Wow, this is fantastic! I love the butterfly, and the bee. 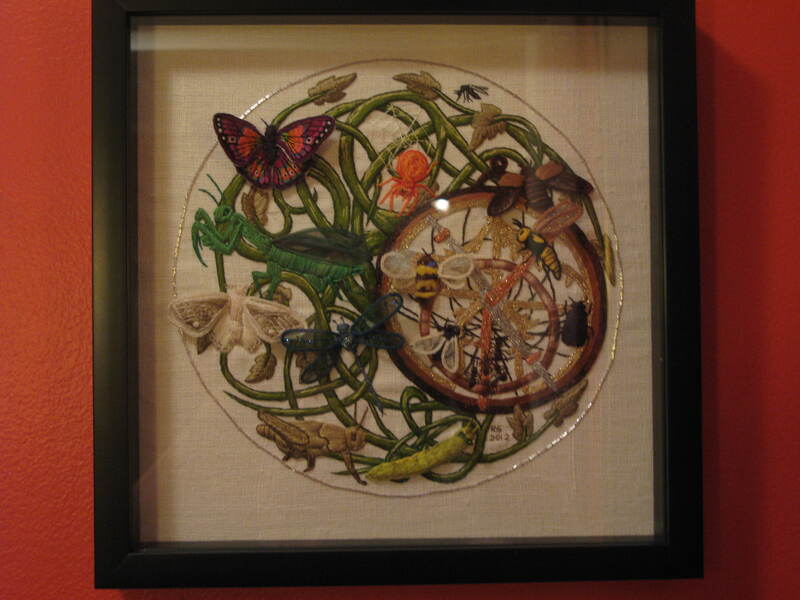 Had you not done stumpwork before doing this piece? Or were you just honing your skills? You look pretty adept at it to me! Well, you’ve certainly got a knack for it…. Guess who’s working thru your archives…this is so intricate and beautiful. Totally in awe. Ooooh, it’s something fantastically amazing! Just hit! I want to see something like this out of your hand! Thank you very much. The bugs you make are beautiful. Thank you, but your comparison is impossible. I’m still just trying to do some insects, but to bring them into such a complex composition, as you did – it is something unreal to me. I sincerely wish you every success! Thank you! But having looked at your blog, your work is beautiful. I especially like your beetle necklaces. They’re lovely. This is absolutely beautiful. It’s a little reminiscent of a tattoo I have; I love bugs! And stitching, obvi. 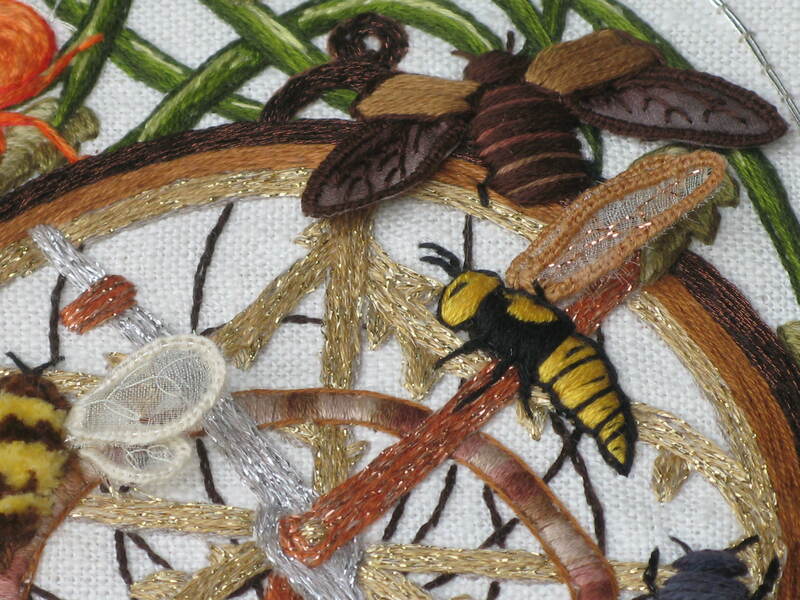 I’m really impressed – I hope to be able to stitch like this someday. Thank you. I really appreciate the kind words, especially as with this piece, I was teaching myself technique as I went. Rene, your words are very pleasant to me. Thank you for pointing me towards Maria Merian. I hadn’t seen her prints, and they are gorgeous. They would make beautiful embroidery. I didn’t use a picture as a basis– I drew the artwork. The inspiration was a series of novels. I looked at pictures of bugs (http://pinterest.com/renesears/bugs/) and astrolabes (http://david-wray.com/wp-content/uploads/myastrolabe.gif). I drew the bugs on sticky notes and moved them around on a drawing of the astrolabe until I liked the way they looked. I hope that helps! It’s hard to be clear with the automatic translator. I’d love to see what you do with many bugs together. Renee, thanks for the reply and link – it was very interesting to know the source of your inspiration. About the novel, I understood, I thought that you used some illustrations of these books. But knowing that you yourself have drawn this composition I’m in even more awe! Elena, please let me know when you post photos! I’d love to see what you make. Thanks, Erin! I would love to tackle a project as big as a corset eventually. There are some amazing historical reproduction pieces out there. Thank you for the recommendation! I will look it up.